I was looking back at a box of old books the other day, when I came across my collection of Tintin and Asterix books. Graphic novels, if you were to ask me now, but just comic books back then. 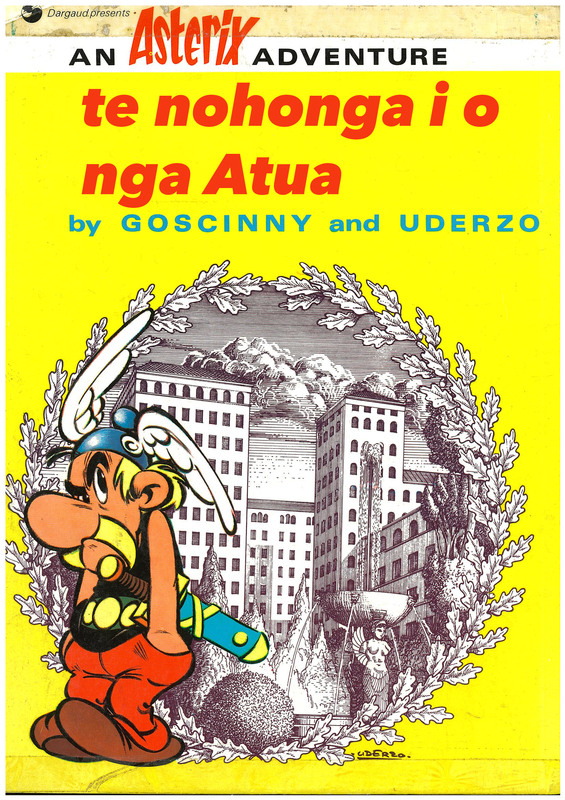 A valuable learning aid for puns (either subtle or brutal) and in my case, French, as our school library only held copies of Asterix in the original French or in German – none in English, so if you wanted to look at the pictures, you really had to learn a language to get the gist. Wonderfully, they are now available in a range of languages including Spanish, German, Gaelic, Indonesian, Persian, Mandarin, Korean, Bengali, Africaans, Esperanto, Czech, Slovene, Welsh, Norwegian, Danish, Icelandic etc etc etc Ancient Greek and even Latin, although not, as far as i know, in te Reo Maori. Maybe there is an opening there. One of the key things that I really like was the characters names. 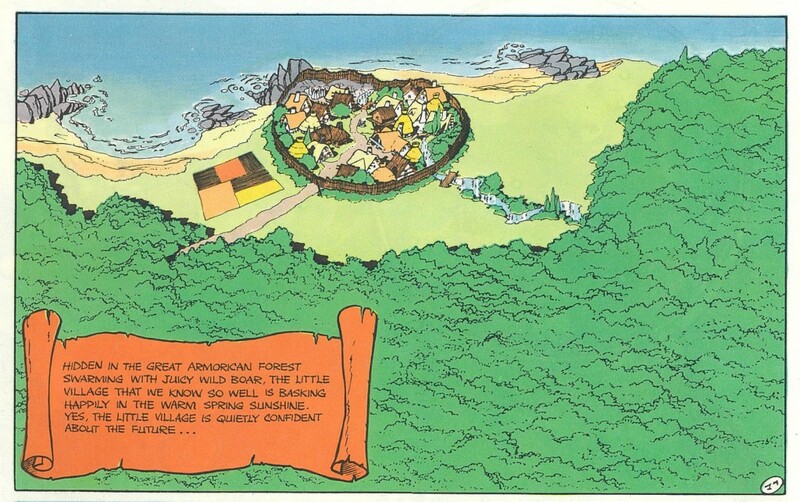 Asterix and Obelix always stuck with their names, but Chief Vitalstatistix (in English versions) is Abraracourcix (i.e. short arms) in French, Copdegarrotix in Catalan, Hasarengazfix in Hungarian, Asparanoiks in Polish and in Hebrew he is known as לוחמאמיקס – let’s see if the website can handle that info! Thanks to Wikipedia of course…. But I realise now that perhaps, instead of just a love of reading and writing, I also engendered a love of architecture. 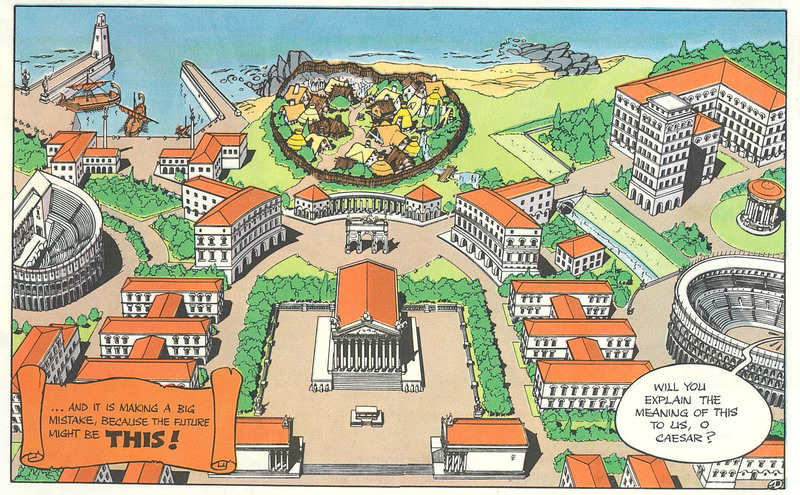 I remember the day that “Mansions of the Gods“ came out, and I was blown away – the 17th volume, it was the first one to really address urbanism – up until then Asterix and Obelix had had lots of adventures, but still really lived in a small Gaulish village. Now however, the dreaded Romans planned to drive out the peaceful Gaulish village by bringing them urbanity, density, and over-crowding. Much like the people in Eastern Suburbs of Auckland reacting to the proposed Unitary Plan, the Gauls were outraged, and didn’t want a bar of it. 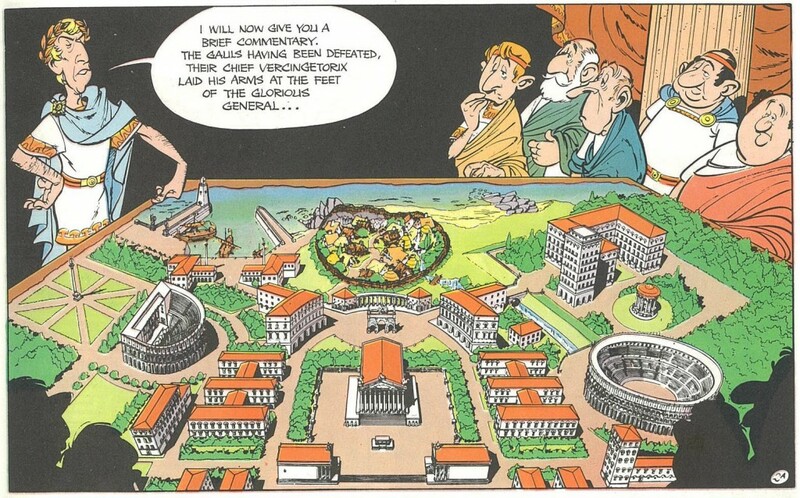 Caesar introduces the architect – known here as Squareonthehypotenuse (which I doubt that many of today’s generation would get), who looks like a typical headstrong young Architectural Graduate and thankfully not like an urban planner like a Corbu, which might have been too much of an in-joke, even for Goscinny and Uderzo. 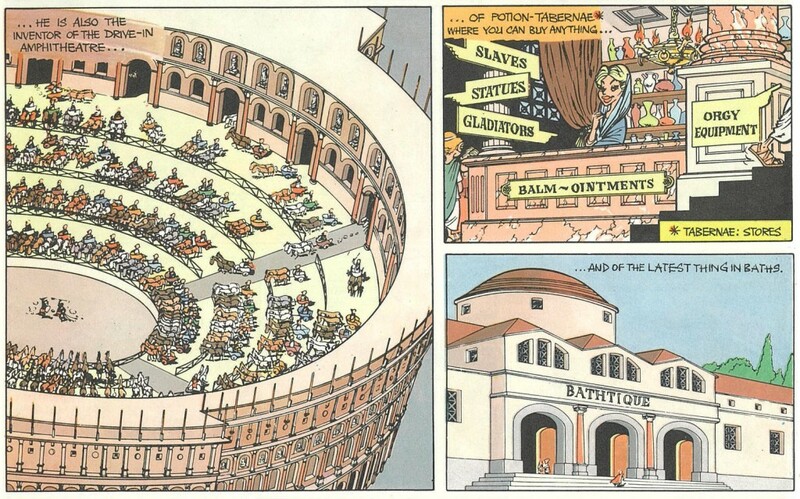 But apparently the quizmaster in the Circus Maximus as depicted, is a caricature of a french TV entertainer of the time. I bet you didn’t know that before ! Squareonthehypotenuse introduces some of the new features of the development, and I think that these were what got me going – architecture and urban planning were real! Live! and Fun! 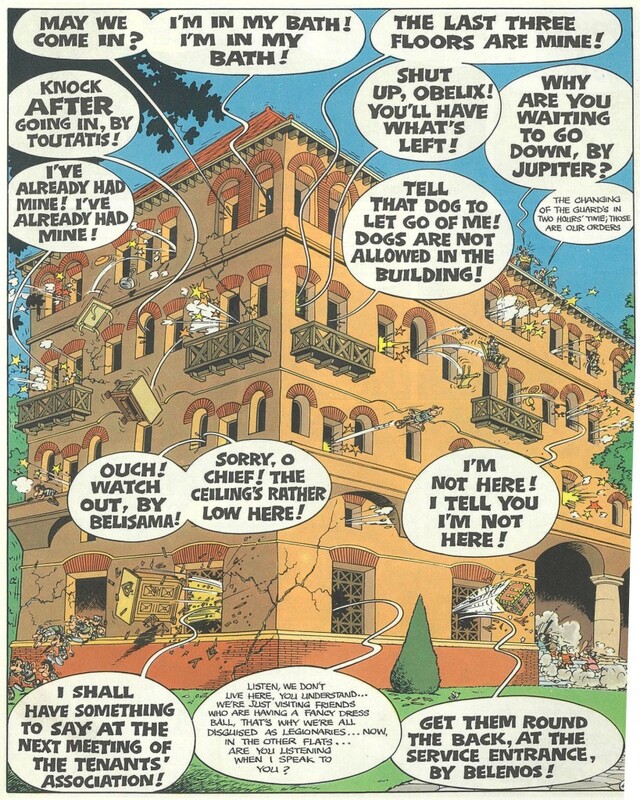 The housing block fills up with residents from Rome, they overshot in the local small Gaulish village that we all know and love so well, and then it all turns to custard. 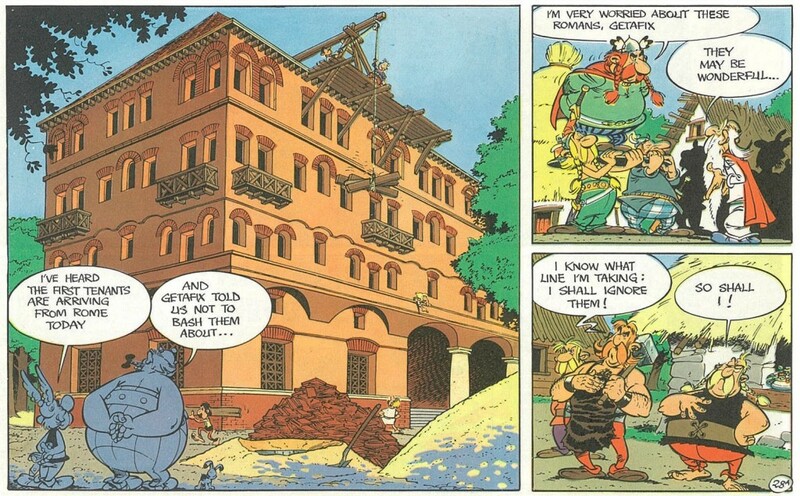 Inevitably, the Gauls cause a ruckus and the Romans move out as their building is demolished around their ears. But I’m pretty sure that this started off a love affair with architecture for me, one that has not, as of yet, completely departed. Attention to detail is all important – I would look for the front teeth of the Roman legionnaires being left behind as Asterix or Obelix whacked them into the middle of next week, birds twittering around their broken heads. Frightfully violent, as I look back on it now, but us little fishes lapped it all up. And I still have a hunger for wild boar even today, by Toutatis! Inevitably, every time a story finished, there was a scene of a feast going on, with Gauls celebrating with boar and beer and mead and a big pot of secret potion. Yum! “Mansions of the Gods” was produced in context of a time when “banlieues” in the vein of Le Corbusier were fashionable. Since then, he’s been cited by the likes of Jane Jacobs as an architectural cautionary tale of how not to do density. Starky – you have a good eye for a design classic there – it took me a while of searching to find a picture of exactly what you were talking about. 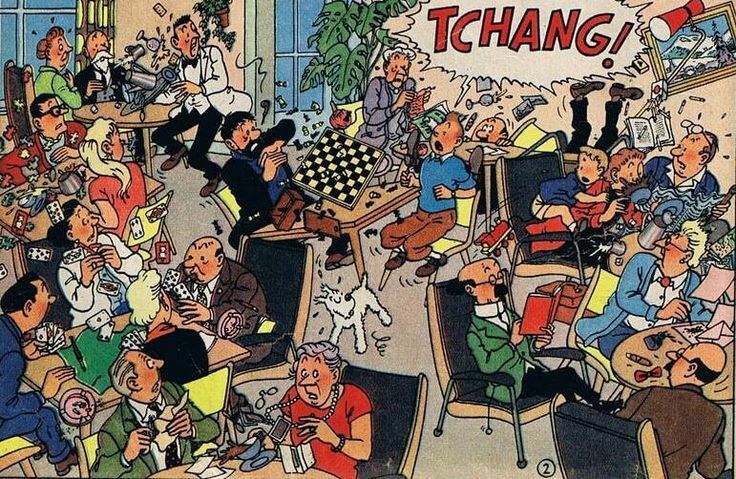 Yes indeed, the TinTin comics were widely referential to the events and places taking place back then – I’ve read somewhere about King Ottokar’s Sceptre, and how it was based on events in Austro-Hungary – according to Wikipedia (who else) “Three weeks after King Ottokar’s Sceptre finished serialisation, Germany invaded Poland”. The countries mentioned in the book, Syldavia and Borduria, are clearly a parody / celebration of all things Balkan, with Albania’s eagle, Bosnia’s Mostar, and generally Bohemian settings. Dammit all I’ve gone off in a tangent and may never get back on track. I had a track?